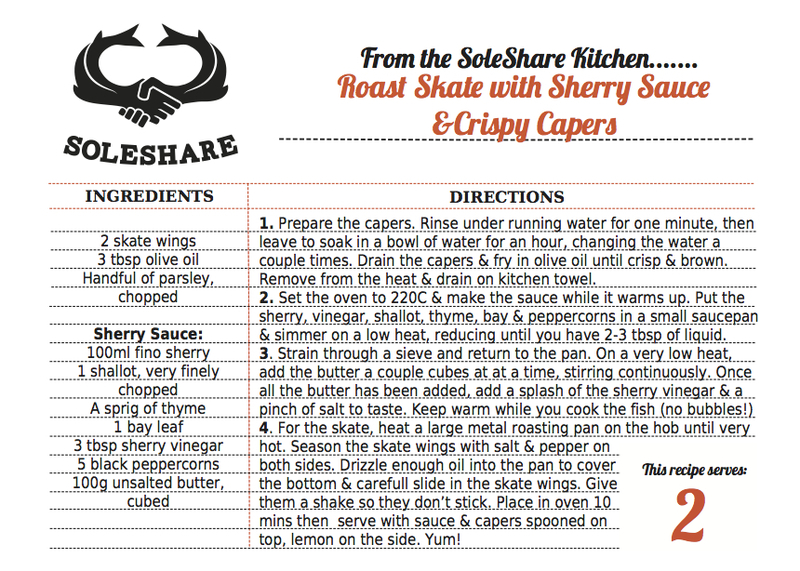 We say skate, but we'll never actually give you a skate, years of overfishing have meant they've virtually disappeared. The rays our fishermen give us will either be blonde or thornback rays and while they look very different, they taste equally delicious. Rays and skates are elasmobranchs, the same family of cartilaginous fish as sharks. We need to be careful with elasmobranchs, as they’re slow to mature and give birth to a handful of young each year. They've been on the planet longer than trees (I know right!? ), so we owe it them to look after them. The ‘common’ skate has now almost disappeared from the channel, but the bureaucrats have learnt from past mistakes and ray fisheries in Europe are pretty well managed these days. Our fishermen rarely target rays- mainly because they don’t have enough quota for them. They do often get caught in the nets though and they’re a real treat. They don’t have any bones, just a fan like array of cartilage. The flesh is sweet and extremely rich. It needs a piquant accompaniment to balance the dish. The French classically use a caper beurre noisette, the Spanish: sherry. They’re extremely versatile, dredged in flour, you can grill, bake or fry them. Or try and Asian twist and simply steam them and serve with a homemade dipping sauce.